Do you have $300 burning a hole in your pocket and really like the manga Fist of the North Star? The eOneBook by Progress Technologies may be the device for you. 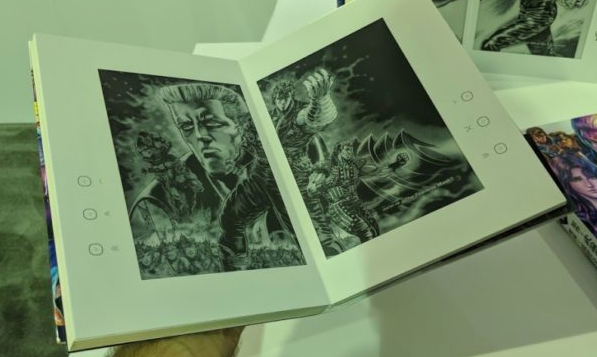 Featuring two E ink displays that fold out like a book, the device can only be used to read 18 volumes of Fist of the North Star. E-readers are great for avid readers. The space- and cost-effective devices run for weeks on a charge and can store tens of thousands of books. Most E-readers are also relatively affordable, coming in between USD $50-100. However, for those that want something completely extravagant, Japanese-based Progress Technologies showed off their new eOneBook E-reader at CES 2018. There's one catch: the device can only be used to read 18 volumes of the Manga Fist of the North Star. The eOneBook is a pretty innovative E-reader. It features two E ink displays that fold out like a book with navigation buttons on either side. The case of the device is also beautifully decorated with cover art from Fist of the North Star. The E Ink displays look crisp and do the detailed artwork of the manga justice. Since the manga is stored as an E-book, users can also switch between Japanese and English translations at the touch of a button. While the eOneBook is undoubtedly beautiful, it's also incredibly expensive considering the package on offer. Progress Technologies is planning on selling the device for USD $300 in the near future, which is a lot for an E-reader. Throw in the fact that there's no way to load any other content on the device and the eOneBook becomes a niche luxury item. However, the device does have all 18 volumes of Fist of the North Star loaded on it. Not only does it save quite a bit of shelf space, it's also one of the cheapest ways to get all the volumes. Considering that single paperback volumes of the manga routinely sell for $50 each, the eOneBook may not be too bad of a deal. You're essentially getting the manga at one-third the price you'd have to pay for the individual volumes. Progress Technologies is also hoping to work with other publishers and bring more content-specific devices to market. No word yet on a possible release date, but if you like Fist of the North Star, you may want to keep your eye on this one.